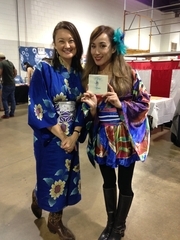 Thanks to everyone at the Nippon Club Festival in Raleigh for a great event on July 29th! Lisa enjoyed performing and hearing the many other great performances by Junko Fujiyama and the Triangle Taiko group. 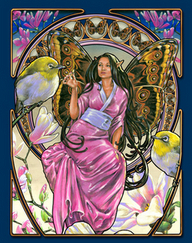 Lisa will be performing Saturday June 24th at the Honeysuckle Tea House in Chapel Hill, NC from 6-8PM. Lisa will be performing at the NC Japan Summer Festival on July 29th, 2017 at 4:00pm. 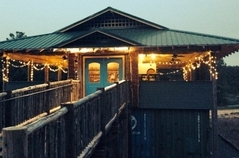 This year the event will be located at the Kerr-Scott Building at the NC State fairgrounds. Lisa performed 3 sets of original music at Caffe Driade in Chapel Hill, NC. Thanks to everyone that came out! It's been a while since Lisa has performed for fans in NC! 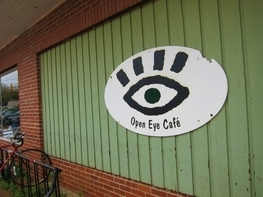 Lisa will be performing 2 sets of original songs at the Open Eye Cafe in Carrboro, NC on Saturday March 11th, 2017 from 8:00pm-11:00pm. See you there! Lisa will be performing a special 2 hour set of original songs at Fuel Coffeeshop (Montlake location: 2300 24th Ave E Seattle 98112) in Seattle, Washington on August 23rd from 3:30-5:30. Hope to see you there! 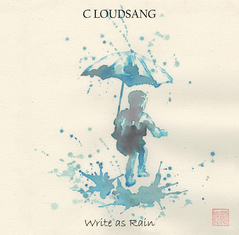 The Cloudsang EP is currently being mastered. The new EP will feature 6 new tracks performed by Lisa, Leon Monroe, and Phil Mauck. Stay tuned for more exciting updates!! Cloudsang performed 2 sets at the Nashville Cherry Blossom Festival. Some old favorites were the Tennessee Waltz in Japanese and favorites from Bleach and other anime hits. New songs from the upcoming EP were well received. Lisa is performing concerts at Realmscon in Corpus Christi, TX Friday, Saturday, and Sunday! Lisa enjoyed performing at the Ibuki Magazine launch party on September 7th in Seattle, WA. Lisa is currently getting ready to record with Cloudsang. "It's the same for either side. multiply and then divide. 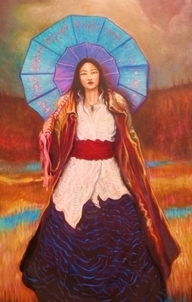 One to the power of one is the power of one times one times one times one times one..."
Lisa Furukawa is currently writing new material and recording with Seattle based duo "Cloudsang"
Hope everyone had a great holiday! Here is a little bit of snow haiku to cheer you up! 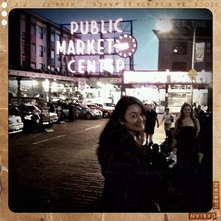 Lisa is now a PNW artist! Lisa's made the cross country move! West coast fans stay tuned for upcoming shows in 2012. Lisa performed Tori Amos's "Winter" in Japanese at Mechacon in New Orleans, Louisiana. Here is a video sample from her Saturday morning concert. Thanks Anime Secrets for posting! Lisa relaxing with convention directors Pete and Jon and Mary Elizabeth McGlynn before Mechacon 2011 begins. The performance! Lisa played music from Samurai Champloo, various music by Yoko Kanno, familiar tunes, and some brand new songs from Signal. 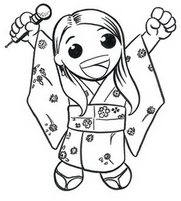 Are you interested in being on the Chibi Lisa Cheering Squad? If you are interested in helping to get Lisa's music out into the world, email us on the contact page. Also, a little talk goes a long way! Lisa's now on facebook, myspace, twitter, itunes, and amazon. Spread the chibi love! Check back on May 18th to listen to another streaming song!